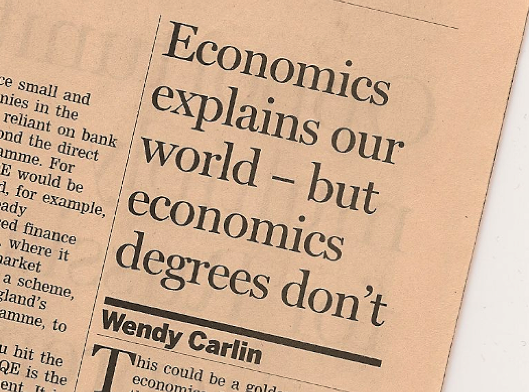 Wendy Carlin’s opinion piece in the FT on 18 November (see the post at the FT here or, if you are not registered, we posted it here) prompted an often passionate debate in the comments below the article, and on Twitter. It also prompted several letters to the editor. I graduated in 2010 with a bachelor’s degree from the University of California, San Diego, with no practical skills or market insights, only an aptitude for multivariate calculus. 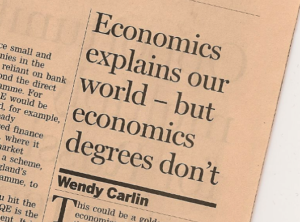 When asked how I know so much about the global economy, economic theory or the markets, I reply that I learnt more from reading the Financial Times every day than I did from my undergraduate degree. [W]e never heard from a business person, entrepreneur, banker, regulator, politician or anyone involved in real economic decisions. The only place of work we visited was the social science department’s coffee bar. By contrast, it is hard to imagine a geologist not going on a field trip or a historian never visiting an old battlefield. During the next few months we will be explaining in more detail how the CORE Project aims to create economics teaching that is more relevant to the global economy, the financial sector, and public policy. If you subscribe using the link on the right hand side of the page, you will receive these updates automatically. Alternatively, follow us on Twitter at @inetcoreteam.